Hans Goebeler is known as the man who “pulled the plug” on U-505 in 1944 to keep his beloved U-boat out of Allied hands. 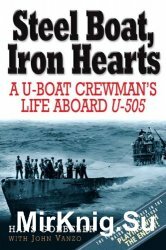 'Steel Boat, Iron Hearts' is his no-holds-barred account of service aboard a combat U-boat. It is the only full-length memoir of its kind, and Goebeler was aboard for every one of U-505’s war patrols. Using his own experiences, log books, and correspondence with other U-boat crewmen, Goebeler offers rich and very personal details about what life was like in the German Navy under Hitler. Because his first and last posting was to U-505, Goebeler’s perspective of the crew, commanders, and war patrols paints a vivid and complete portrait unlike any other to come out of the Kriegsmarine. He witnessed it all: from deadly sabotage efforts that almost sunk the boat to the tragic suicide of the only U-boat commander who took his life during WWII; from the terror and exhilaration of hunting the enemy, to the seedy brothels of France. The vivid, honest, and smooth-flowing prose calls it like it was and pulls no punches.